There are many Catholics who believe that praying the Rosary during Mass constitutes a distraction from the Sacred Liturgy. The post Vatican II Church recommends active participation during the Mass so emphatically that anything that encourages individual recollection and impairs communitarian activity is strongly discouraged. Today, Catholic forums are littered with questions from the faithful, typically younger Novus Ordo Catholics, asking if it really is allowed for an elderly parishioner in their Church to be praying the Rosary instead of actively engaging in the responses, singing and hand-holding participation of a New Mass. There are many Catholics who view the Mass-time Rosary with suspicion, as if it is some foreign stain against the Faith that has thrived on ignorance in spite of the priests who seek its elimination. What this mindset reveals is the tyranny of the post-Conciliar Church in eliminating practices that oppose its ideal of "active participation." It is a sad consequence to see that so many Catholics now look down on the Mass-time Rosary. Though it may come as a surprise to some, the practice of praying the Rosary during the celebration of the Mass was not only permitted but encouraged by past Popes and Roman Curia. As many as there are different men there are different tastes. This applies not only to food and art, but also to devotions. With the differing strengths and weaknesses of a person’s individuality, we may find ourselves more attracted to one kind of devotion over another. Whereas one person may find a type of prayer or meditation to be most fruitful in the pursuit of sanctity, another may find that same practice deadening. It is characteristic of the universality of the Catholic Church that there are many different meditations, prayers, books and religious practices established to suit the needs of the many. No one who seeks earnestly for prayers and meditations can find the Barque of St. Peter meager in providing such supplies. Praying the Rosary during Mass thus existed as an honored devotion that served many of the faithful. Prior to Vatican II, prayers and devotions during Mass were considered good to the degree that they elevated one’s soul to God. Those who did not have a Missal or did not want to use one could pray the Rosary as a means to elevate their minds to God and in this way unite themselves with the mysteries that were being renewed on the Altar. Although following Mass with the Missal is a good practice, the Rosary offers also a good practice to anyone who was thus so inclined. Whether it was through necessity or one’s personal preferences, the Rosary always offered a means to gather much spiritual grace if prayed during Mass attendance. It is said there is no better time for prayer than the Mass and, before Vatican II, it was common to see Catholics praying the Rosary during the Liturgical Celebration. The Mass-time Rosary is still a common practice in many countries to this day. These words of Pius XII were quite clear in allowing anyone to say the Rosary or other prayers during Mass. However, an even stronger and more explicit endorsement supports the same custom. In 1883 Pope Leo XIII had written these words in his Encyclical Supremi Apostolatus: "Not only do we earnestly exhort all Christians to give themselves to the recital of the pious devotion of the Rosary publicly or privately in their own house and family, and that unceasingly, but we also desire that the whole of the month of October in this year should be consecrated to the Holy Queen of the Rosary. We decree and order that in the whole Catholic world, during this year, the devotion of the Rosary shall be solemnly celebrated by special and splendid services." "From the first day of next October, therefore, until the second day of the November following, in every parish and, if the ecclesiastical authority deem it opportune and of use, in every chapel dedicated to the Blessed Virgin – let five decades of the Rosary be recited with the addition of the Litany of Loreto." "Doubt V – The same Decree [of Leo XIII issued on August 20, 1885] rules that Rosary must be recited with the Litanies among the prayers carried out by the faithful. We ask whether these words should be understood as the Rosary to be said at the same time of the celebration of the Mass; or that the Mass should be celebrated before the recitation of the Rosary and Litanies as usually happens in the Palentina Diocese." As such, this decree unambiguously stated affirmative: the Rosary is to be prayed during the same time as the celebration of the Mass. This endorsement by Leo XIII and its confirmation by the Congregation of Rites definitively established the Rosary as a legitimate accompaniment to the Mass. Several indulgences were granted to its recitation, and the Sacred Congregation of Rites confirmed this position again in 1887. An objection could be raised that these pronouncements of Pope Leo XIII dealt specifically with the recitation of the Rosary during Masses in October. To this we respond that while the aforementioned declaration established the recitation of the Mass-time Rosary for October, it made evident that the Rosary is essentially an acceptable form of worship to accompany the Mass in general. The papal declaration granted special indulgences to doing so in October, and by extension showed that there is no conflict with praying the Rosary during Mass. Since this established that the Rosary is in harmony with the liturgy, not in opposition to it, it becomes clear that the Rosary is a perfectly acceptable devotion during Mass for anyone who is so inclined to pray it. Pope Pius XII reinforced this position with Mediator Dei, including prayer of the Rosary in those devotions that are cooperative with the Mass. 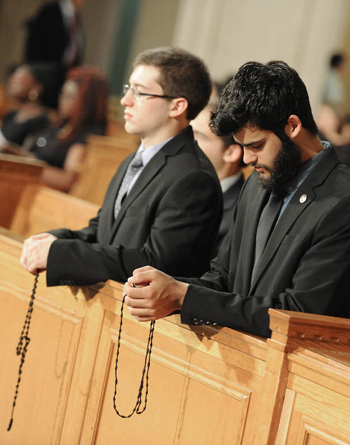 The Mass-time Rosary is a devotion that assists the supplicant in raising his spirit to God. As a practice it provides a legitimate spiritual means for those who are so inclined to say it. Pius XII endorsed the Rosary as an appropriate means of assisting at Mass and Leo XIII also did so by allowing it to be said during Mass and by granting indulgences to do the same during the month of October. Progressivist hierarchy and clergy today despise anything that detracts from their ideal of "active participation," yet, despite their hatred, the practice of praying the Rosary during Mass is a firmly established tradition that has the approval of past Popes and the Sacred Congregation of Rites. To unite oneself with the Mass by praying the Rosary and meditating on its mysteries thus continues to stand as a legitimate, praiseworthy and respectable custom of the Holy Catholic Church. Let those who so wish honor Our Lady and Our Lord in this way. Personally speaking, I usually say the rosary starting with the Mass of the Catechumens. I can finish it by the time of the final blessing. However, I'm thinking of composing a personal prayer book with different prayers to be said and meditated upon during the different parts of the Mass. Anyone has any ideas? Directly related to the traditional practice of praying private devotions when hearing Mass, including the Rosary as referenced in the OP, this article is an absolute must-read. Sometime in the period between the end of the 16th and the beginning of the 18th century, an illustrated tract in the form of a popular Missal or Mass Book was printed in France or in the southern Netherlands. Presenting the Roman rite of the Mass as an allegory of the Passion of Christ, the scene corresponding to each ritual action is expressed and emotionally interiorized by a devout prayer. This testifies to the difficulty of making a clear and absolute distinction between devotion and liturgy, between individual and community, between the private and the collective. To the owner of the booklet – probably a devout member of a French confraternity of the Guardian Angels - attending Mass meant bringing together these dimensions of religious practice. Not only for the silence of the Canon Prayer, but for the entire (low) Mass, an illustrated booklet (fig. 2) was printed in French sometime in the 17th century or around 1700. What it did was precisely to provide devout prayers, fitted to the priest's prayers as recommended in the above mentioned Mass Book of 1651. Title page of TABLEAUX / OU SONT REPRESENTÉS / LA PASSION / DE N.S. JESUS-CHRIST, / ET LES ACTIONS DU PRESTRE / A LA SAINTE MESSE. Below, the title there is an exhortation to priests leaving the sacristy to celebrate Mass, admonishing them to leave it pure as angels and approach the altar burning with love, to celebrate the mystery where the Lamb of God offers His blood to the Father to save all mortals. Thus, Mass is established as a re-enactment of the Passion of Christ. This present text, then, presents briefly this short tract to be studied further and more comprehensively by others. It amounts to what could be defined as a popular illustrated Missal or Mass Book – even if it does not contain any of the prayers or texts of the Mass. No. 10 of the woodcuts in the Missal. Above the picture the text says: 'Jesus remains silent and humiliates himself before Herod', corresponding to what is said below: 'As the Priest says in a very low voice «Munda cor meum», Purify my heart.' The prayer «Munda cor meum ac labia mea» was said sotto voce by the celebrant and the deacon before the Gospel was read. Together texts and pictures render the entire Mass step by step, each prayer to a certain extent mirroring the order of the Roman rite as it appeared after the Council of Trent. This does provide a terminus post quem of 1570. The main perspective of this Missal, however, continues the medieval concept of Holy Mass as mainly an allegory of the Passion of Christ. In a Catholic prayer book with the title Geistlicher Blumenkrantz, published in Münster, Germany, in 1658, a woodcut was used to illustrate Wie und was gestalt ein Catholischer Christ Mess hören soll, 'how and in what frame of mind a Catholic should attend Mass.' (fig. 4) The picture shows Christ on a Cross planted in the aorta of the Sacred Heart in whose side wound a human soul lies. The Crucifix is flanked by the instruments of the Passion. The disposition of the devout Catholic is pictured as seeking shelter in the Sacred Heart of Christ, the soul hiding in the side wound of His Heart. In doing so the soul literally immerses itself in the Passion of the Lord, that unique salvific event through which mankind is redeemed. The Passion is re-enacted in every Mass, where the self-sacrifice of Christ is remembered sacramentally in such a way that it once again becomes present and effective. Therefore, Holy Mass was truly an allegory of the Passion. Prayerfully to follow and contemplate the parallel progress of Mass and Passion was the right and devout way of attending Mass. Woodcut on p. 53 in the Catholic prayer book Geistlicher Blumenkrantz, published in Münster 1658. The picture introduces the third chapter which presents the order of the Mass. Each page of our booklet contains a heading relating to some part of the Passion. (fig. 5) A woodcut then shows the corresponding rite in the Mass, and a sentence below explains which rite is rendered in the picture. Then a prayer follows, to be said by the devout at that particular moment during Mass – reflecting the thematic focus of the rite. It must be noted, however, that the correspondence between rite and Passion scene at times seems somewhat arbitrary, arranged in order to follow the ritual more than to visualize an inner accordance between the two. Fig. 5 shows this lack of logic connection between them quite clearly – strangely enough, the prayer below does not in any way mention the listening to the word of God. One page from the Missal showing the reading of the Gospel corresponding with Jesus being sent back from Herod to Pilate. The faithful asks for the courage not to fear what the schemes of evildoers would do to him, but at all times to be able to make such evil schemes advantageous to his salvation. In this, then, he would imitate Jesus, his saviour and Redeemer. As the booklet was clearly intended for a lay audience, it is surprising that the title page contains a text directed to the priests. The function of this text, however, seems to have been to promote the appropriate awe of the ministerial priesthood, and to present the Mass as the very re-enactment of the sacrifice of the immaculate Lamb to the salvation of mankind. A tract like this – and actually 17th and 18th century devotional literature as such - obviously expected a considerable literacy among laypeople. Yet, the main vehicle of the contemplation was the pictures rendering the visible the ritual which formed an entrance to a specific theme or particular part of the Passion. This should now be remembered, meditated upon, contemplated and applied to one's own life. As one could for instance read in a Spanish book from 1701, illustrated with scenes from the Passion, the use of the book ought to be to visitava y consideraba con gran fervor y lágrimas en la memoria de su lastimado Jesús, 'by the remembrance of the suffering of Jesus behold and reflect on them fervently and with many tears.' The octavo format of our booklet made it easy to bring along to church to do just that. Typical of this popular Missal are the four initial prayers on the pages 2-5, the prayer before Mass with a Crucifix and the prayer when the priest approaches the altar - corresponding to when Jesus proceeded to the Garden of Gethsemane; (fig. 6) the prayer when the priest stands in front of the altar as a picture of how Jesus entered the garden and starts praying - and the prayer accompanying Confiteor, the general Confession, corresponding to Jesus sweating blood during His prayer. Pages 2-3 with prayers before Mass and as the priest enters the sanctuary. My Lord Jesus Christ, I pray that you give me the grace to attend the holy Sacrifice of Mass with a pure heart, for the glory of your name and in remembrance of everything that it has pleased you to do and suffer for my salvation. Amen. “When the priest goes to the altar”: My Lord Jesus Christ, Son of the living God, who in the time of your Passion wanted to surrender yourself to sadness and to have your heart weighed down by the greatest sorrow; grant me the grace to offer and consecrate all the sorrows, pains and worries in my life to you. Conform them, if you please, God of my heart, to your sufferings, that all these hurtful things - through the merits of your Passion - may become useful and beneficial to me. Amen. “When the priest begins the Mass” (fig. 7): Jesus Christ, my Saviour, Son of the Living God, who wanted that an angel should strengthen you during your prayer which you made to your Father: that - provided this was His will - you should not drink the chalice of suffering. Grant me through your almighty power the grace to be supported and strengthened in my prayers by my Guardian Angel. Amen. The priest begins Mass served by two altar boys. The altarpiece shows Christ praying in the Garden of Gethsemane, corresponding to the priest's very first prayer from Psalm 42: "O God, sustain my cause; give me redress against a race that knows no piety; save me from a treacherous foe and cruel." "When the priest says the Confiteor" (fig. 8 ): Jesus Christ, Saviour of the World; if it pleases you, grant that I, when I consider how ardently you prayed to your father, your face to the ground in your anguish in the garden; how your sweat trickled like drops of blood running from your body, grant, then, that I be capable of opening my heart to such a love that I may become totally pierced by it, and that I before you may pour out tears in abundance. Amen. A page concerning the Confiteor. Such a page may have reminded the reader of the simple and unsophisticated religious emblems, with Inscriptio, Pictura and Subscriptio, a heading, a picture and an explanatory text. The heading mentions a specific scene from the Passion; the picture correlates the liturgy to the scene. The explanatory text shows how the devout by attentively and meditatively following this may awaken the right contrite love. The introductory prayer displays the disposition with which one should attend Mass, and describes Mass as a re-enactment of the Passion, to keep the memory of it alive in the devout. The second prayer opens the theme of imitation, thereby attaching meaning and, indeed, virtue, to human trials and tribulations by conforming (unissez-les) them to the suffering of Christ. In this as in the fourth prayer the devout articulates a typically Baroque, contrite and highly emotional faith, brought about by contemplating the image of Christ in Gethsemane, interiorly imitating His anguish and pain. The first prayer reveals the Catholic tradition, and so does the third prayer when it mentions our bon Ange, displaying the growing interest in the Guardian Angel at the time. Nevertheless, first and foremost these heartfelt prayers articulate the emotional approach typical for both Catholic and Lutheran, not least Pietistic, devotional piety in the 17th and early 18th century – as do the other prayers in the book. To consider the Passion of Christ with great devotion was not primarily a mnemonic activity, but an imitative and contrite devotional practice which should bring the reader/beholder to shed tears of compassion and contrition; une grande abundance des larmes, or, as the Spanish book of 1701 put it: con gran fervor y lágrimas. However, it must be remembered that our booklet is not primarily a kind of illustrated Passional, but a popular Mass Book, meant to serve a lay person's transformation of the proceedings at Mass into a contemplation of the Passion of Christ and the application of the things considered to his or her personal life. The modest tract titled "Tableaux" thus testifies to the fact that the clergy did attempt to conform the devotions during Mass to the Ordo Missae, establishing a correlation between the allegory of the liturgical actions described and depictured in the booklet (fig.9) and the individual pious attachment to them in terms of a personal application. Having said the Confiteor, the priest kisses the altar, woodcut no. 4. The altarpiece now shows how Christ was betrayed by a kiss. As the priest bowed down to kiss the altar, he prayed silently the Oramus te, Domine, that God might pardon all his sins through the merits of the saints whose relics were placed in the altar table. To the devotional life of the believer, practices were important or even vital as they articulated, expressed, shaped and fortified his or her faith and piety. Practices were not only a matter of form -'vessels' containing or expressing piety and devotion - but practices shaped and created piety in a way which makes it difficult to make any clear distinction between form and content, between devotion and devotional practice – difficult even to make a distinction between the spiritual and physical dimension of devotion. Hence, instruments of devotion are not secondary phenomena, but integrated elements of the devotion themselves. In the same way, the attended liturgy of the Church was not in opposition to this in terms of a collective practice contrasted with an individual practice. Even the practice of individual prayers by books of hours cannot be viewed as expressions of purely private piety, but such practices did encompass collective or community aspects. This would, then, a fortiori be the case with the Mass liturgy as well. The illustrations in our booklet showed the Roman rite as the exterior dimension of the liturgy, the altar paintings above the altar pointing to the interior dimension of the liturgy - the prayers, then, expressing how Holy Mass was interiorised as a meditation on the suffering and death of Christ. Basically, a liturgical practice can only survive as an important element in faith if it also becomes a devotional practice. Even if considering the Passion was not primarily a mnemonic or catechetic exercise, meditation on the account of the suffering and death of Christ was regarded as a most excellent way of enflaming the hearts with love and gratitude towards Him. This most holy of stories was in itself the source of all Christian virtues, as explained by a catechism for the French diocese of Mans, published in 1695: l´Histoire de la sacré Passion, don´t le récit est plus proper à exciter dans les coeurs l´amour et la reconnaissance envers lui, Jésus-Christ, et dans laquelle on peut faire remarquer plus sensiblement des exemples de toutes les vertus Chrétiennes. In this way each Mass became an hour of catechism - and a devout repetition of things already learned. Thus, for laypeople every Mass was converted into a private devotion, which did not, however, run freely and arbitrarily, but conformed to the order of the Mass, reflecting this order and its various themes. In this sense our illustrated booklet did indeed serve as an instrument of devotion – of what we may call 'liturgical devotion'. It transposed the structured theological content provided by the Roman rite to a spiritual and emotional level articulated by scenes from the Passion and by fervent prayers. The devout should follow what was going on at the altar and not simply stick to their private devotions. Following the Mass attentively and devoutly, they would recognize what happened from the illustrations (fig. 10), relate it to some specific scene in the Lord's Passion as shown by the headings - and the altarpieces as pictures in the pictures - and finally in a moral and spiritual sense the faithful should apply it on their personal lives – the application described and testified to by heartfelt prayers. 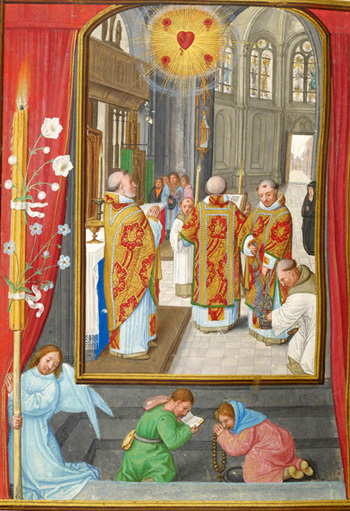 Having kissed the altar the priest goes to the epistle corner (right) to read the Introit proper to the day. The altarpiece shows how Jesus was caught and tied by the Jews. In the paintings above the altar in each woodcut, one may also see a reference to the Jesuit method of compositio loci, as set forth in the Spiritual Exercises by Ignatius of Loyola, written in the early 1520s, published in Latin in 1541 with the title Exercitia spiritualia and promulgated by Pope Paul III in 1548. 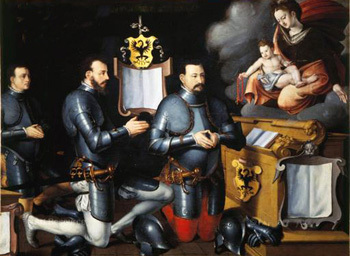 Clearly related to late medieval devotion with its roots in the devotio moderna of the 14th century, the compositio loci, (in Spanish, composición viendo el lugar), is the inner vision of the devout imagining the scene with all its details - the vision, then, shaping the emotions and prayers. Ignatius wanted the devout to contemplate (contemplar) and reflect on (meditar) these matters based on envisaging the biblical events - imagining them, visualizing them in all their details in order to be transported there. Examples of such emotional, elaborate and highly detailed descriptions of scenes from the Passion are common in Baroque homilies. The compositio loci would thus at the same time make the devout present at the scene and make the scene present in the mind of the devout. If the prayer concerns suffering, then one should ask for suffering, tears and pain together with the tortured Christ. From this point of departure, then, the fourth prayer, given above, does exactly that. Mass and Passion seemed to merge. Reflecting on such an instrument of devotion like our simple Missal, we realize the difficulty in upholding a clear distinction between individual piety and the liturgical collective. The border tends to become blurred, the two practices blending, containing a both individual and collective dimension. The order of Mass and the actions of the priest evoked a remembrance or even actualization of the Passion, thereby shaping the individual devotion. It really did matter what the priest was doing at the often distant altar. Yet, the degeneration of lay Mass attendance to merely being in the church when the Holy mysteries were celebrated was a latent risk. Sometimes, gazing at the elevated host at a certain point in time was the only collective act during Mass, since otherwise one was occupied with one's private devotions. Apart from once a year, at Easter time, even communion was mostly spiritual and no external collective action. Acknowledging this problem, proper Mass attendance, therefore, was taught and promoted by the Church through instruments such as our booklet, which served the forming of a 'devout attendance'. When the liturgical constitution of Vatican II stated that liturgical acts are not of a private nature, and that during the rites of the liturgical community private devotions should always take second place, this should not be understood as a focus entirely on the external or purely collective dimensions of Holy Mass, in terms of an activism or a removal of the individual aspect, as the quasi concelebration replaced the former individual devout attendance. In fact, the concept of 'active participation' comprised the internal disposition, the actuosa participatio obviously having an interior as well as exterior dimension, none of them to be neglected. Perhaps the main result of the liturgical constitution – reaping the fruits of the Liturgical movement in the previous decades - was that celebration of the Holy mysteries had become a shared experience, merging the order of Mass with the prayers of the faithful. Earlier, at best, the private prayers had reflected the order of Mass as one coherent meditation on the Passion, the liturgy acting as a device recalling the Passion and structuring private devotion accordingly - as our short, illustrated Missal shows so clearly. Having finished the Introit, the priest returns to stand in front of the altar during the Kyrie. The altarpiece shows how St. Peter renounced Jesus, and the text of the Kyrie, 'Lord have mercy', does articulate the contrition and repentance of the devout Christian, who – like Peter – had renounced Christ so often and now should weep bitterly. So, this small booklet titled "Tableaux, etc." shows that it is no simple and straightforward matter to draw a sharp line between private and communal devotion. Even the official liturgy of the Church was meant to instigate private devotion. From the Middle Ages and until the 20th century, attending Mass in the proper way was basically to make it a devotional practice. However, it should obviously not be entirely private, since Mass was attended with others and all shared a common focus point – the priest at the altar. Even the private prayers were shaped, conformed and correlated to the order of the Mass with its external actions as a salvific re-enactment (fig. 11) of the Passion of Jesus Christ. His sacrifice – and indeed every Mass celebrated – was an act pour sauver les mortels. Instruments of devotion like our modest 17th century tract with its pictures and prayers served the merger between official cult and private application. "The Holy Mass is a prayer itself, even the highest prayer that exists. It is the Sacrifice dedicated by our Redeemer at the Cross, and repeated every day on the altar. If you wish to hear Mass as it should be heard, you must follow with eye, heart, and mouth all that happens at the altar. Further, you must pray with the priest the holy words said by him in the Name of Christ and which Christ says by him. You have to associate your heart with the holy feelings which are contained in these words and in this manner you ought to follow all that happens on the altar. When acting in this way you have prayed Holy Mass." "Don't pray at Holy Mass, but pray the Holy Mass." Unfortunately I have been unable to find the exact source of St. Pius X's words, but they are printed in my 1960 edition of the St. Joseph Daily Missal and this morning I found them cited at least a half dozen times at various Catholic web sites. You may want to consider "Blessed Be God" by Fathers Charles Callan and John McHugh, published in 1925. I believe the forum's Dear Leader has called it the "Swiss Army Knife of Catholic prayer books". It includes numerous devotions, including for each day of the week, the month, and the season of the liturgical year, Sunday Vespers, the Collect, Epistle, and Gospel for each Sunday and Feast Day, as well as the Ordinary of the Mass. Especially of interest may be the section "Prayers at Mass", which has a prayer (an instructive meditation in may respects) to be said at each part of the Mass. This prayer book is available in reprint from many traditional Catholic sources, and at times a reasonable priced original edition can be found on eBay. We pray the rosary before the mass starts. I rather read prayers from the missal and attentively follow what is happening on the altar. For centuries our ancestors did just that although hand missals haven't appear till the start of 20 century. However I am willing to try and incorporate this practice but I would particularly focus on the sorrowful mysteries. With my special circumstances, I usually pray the Rosary starting before Mass and then on through the start. I'm usually finished by the Gospel. Then sermon time is when I read the readings. The problem, if I may put it this way, is that your 1960's St. Joseph Daily Missal is already a product of the infamous Liturgical Movement, impregnated with the false notion of actuosa participatio that gave us the Dialogue Mass, layman singing (with women) in place of the clergy and the complete liturgical meltdown of the Roman rite in the 50's and finally in the 60's with Vatican II and the Novus Ordo. These phenomena are all interconnected and inseparable. The aim of the Liturgical Movement that started in 1909 was the liturgical end product of 1969: a liturgy truly for the people with the priest presiding. A spiritual aggiornamento where the people would actively participate with their voices in the responses given to the priest and sing along with the clerical choir, or in place of it, just like the tradition of the Protestant Church. In this state of affairs, it's normal that the traditional devotions associated with hearing Mass were progressively frowned upon, sometimes forbidden and then fell into complete disuse in the years prior to the Council. Even today, in our traditional circles, the liturgical norm followed when celebrating the TLM is the vocal actuosa participatio that anticipated the NO. It's not like the New Mass came out of nowhere. The main ideas behind it were brewing with great enthusiasm for 60 years with the approval of Rome, especially from Pius XI onwards. The dismantling of the Roman rite was finalized after the Council but the traditonal rite was already dead in the water by the time Pius XII gave his blessing and approval to the vandalization of the Holy Week ceremonies in 1955, starting with the Easter Vigil in 1951. The St. Pius X quote itself you shared may or may not be factual. The fact remains that devoutly following the Mass is not an indictment against praying the Rosary during the liturgy, as we've seen in the OP and in the centuries-old traditional spirituality of the Roman Mass. Private devotions prayed during Mass are supposed to foster piety and connect the layman with what is going on at the altar, a mystical reading and contemplation of every part of the Mass and its connection with Calvary. The Via Crucis is another beautiful and traditional devotion that can be intertwined with the actions in the sanctuary. It is our proper inner disposition, via spiritual devotions and the like, the crucial aspect to hearing Mass devoutly. Not what we say or sing. All of this is profoundly traditional and was the main way to hear Mass for more than 1300 years. The 17th century Mass booklet that I've shared in the previous posts is a wonderful example of a now lost Catholic spirituality of the Mass, highly symbolic and mystical, not yet tainted with the Protestant notions of lay (and vocal) participation in the holy mysteries and the Modernist desire to simplify, desacralize and rationalize all liturgical actions. Thank you for your suggestion. I'll look it up. Thank you Vetus Ordo for these wonderful images and hard work. I just wanted to add to Moneil's point which is St. Pius X did make more of active participation than people might not want to accept in a discussion and also he was known for saying he was happier to hear the singing of the faithful during Mass than fine polyphony. I think the discussion is not easily answered. I think both have their place with polyphony and the simple singing of the faithful. I've never liked the dialogue Mass personally, but I've seen it in Spain & Italy (of course in places in the US). I think the real answer is whatever is most conducive to the sanctity of the priest so maybe for a monk no dialogue and wonderful clerical chant and for the parish priest whatever best helps him pray. We are sanctified through the holiness of the priest during Mass. I've often thought of doing the same, regarding a prayer book. I know Fr Z recommended doing that practice when I heard him speak at a conference. Really makes it "your own". Moneil is SPOT ON. Blessed Be God is pretty awesome. It's my favorite prayer book, having replaced the previous "top spot" "My Prayer Book" by Fr. Lasance. Also, it was compiled/edited by Dominicans. But I found that out AFTER I loved it. Hat tip to Gardener for exposing me to it. While supporting Catholic publishers is well and good, I'd argue it's superior to get one cheaper off eBay! $40 seems a little pricey, at least for my blood.